Research tackling questions in the fields of Cancer, Inflammation and Immunity, as well as various combinations thereof (so called “Immuno-Oncology”) is exploding. Researchers are increasingly able to harness the body’s immune system to fight progressing cancers. It was inspiring to participate in the 2017 Cell Symposium on Cancer, Inflammation and Immunity and learn more about “... recent findings in basic immunology, cancer-immune cell interactions, cancer immunotherapy, as well as new approaches to reprogramming tumor-associated inflammation for therapeutic benefit ”as stated by the organizers. Here I aim to compile a few highlights from the conference which reflect how cancer/immunology researchers are preparing and carrying out this multi-pronged attack. The conference opened with a very interesting presentation by Professor Guido Kroemer from the Institut Gustave Roussy. Professor Kroemer discussed the effects of starvation on cancer therapy. Findings in previous animal studies suggested that fasting has a positive effect on cancer treatment (Ref 1). As described in the presentation, starvation or the use of caloric restriction mimetics trigger autophagy and, in a mouse model led to improved anti-cancer immunosurveillance and reduced tumor mass. Methods to study autophagy can be found here. Fun fact: I also learned that Professor Kroemer often functions as one of the “healthy human volunteers” in his studies! This was followed by a talk from Professor Karin about alcohol and obesity as driving factors for chronic inflammation which in turn suppresses cancer immunosurveillance. The presented study analysed a model of hepatocellular carcinoma, a cancer which can develop from a state of chronic hepatitis caused by hypernutrition and alcohol consumption. Chronic inflammation is a dangerous state for the body to be in and usually self-limiting effects kick in trying to resolve the inflammatory state by inducing immunosuppressive measures, for example the upregulation of the immunosuppressive cell surface receptor PD-1. This immunosuppressive environment in turn may represent a favorable state for tumor progression (Ref 2). Future treatments may need to target this immunosuppressive reaction in order to improve therapeutic outcomes. If you are studying inflammation and immunosurveillance have a look at our Immunology Research Plasmids and Resources. With increasingly sophisticated visualization techniques it is possible to follow the interactions between tumor and immune cells in real time. Addgene depositor Professor Max Krummel from UCSF showed some impressive videos of these interactions (Ref 3). You can find useful tips on in vivo imaging in our Fluorescent Protein Guide. Throughout the conference aspirin and the use of COX inhibitors was discussed and Professor Caetano Reis e Sousa from the Francis Crick Institute concluded “Aspirin promotes autophagy, inhibits platelet aggregation, and potentiates the effect of PD-1 blockade.“ (Ref 4). PD-1 helps tumor cells evade the immune system - COX inhibitors like aspirin may give our immune system the boost it needs to help rid us of cancer in combination with chemotherapy. To dive deeper into this field read our recent post “Cancer and the Immune System: Deciphering the Relationship” by our guest blogger Subhadra Jayaraman, a doctoral candidate at Binghamton University! Cancer therapeutics: The so called field of Immuno-Oncology, a sizzling hot topic, includes studies on novel cancer therapeutics such as (Chimeric Antigen Receptors) CAR T cells and PD-1 modulators. An exciting development in immunotherapy is the combination of the CRISPR/Cas9 methodology with T cell receptor engineering (Ref 5) as described by Blue Flame Addgene depositor Professor Michel Sadelain from the Memorial Sloan Kettering Cancer Center. In contrast to using randomly integrating viral vectors, CRISPR/Cas9 genome editing allows targeted engineering of the TCR locus. He also highlighted the UCSF Immunoprofiler - a human biopsy analysis platform focused on analysing immune measures and correlating them with tumor mutations and clinical responses. This platform has the potential to become an open-source pipeline and data repository for cancer researchers. Go open-source! During the poster session I got a chance to talk with Dr. Friedmann-Morvinski about tools used to analyse the tumor microenvironment (one of the plasmids on her poster is pTomo-Ras which has been deposited at Addgene was used to produce the glioblastoma model for this study (Ref 6)). In addition, it was exciting to see that the use of optogenetic tools is expanding to immunological research. 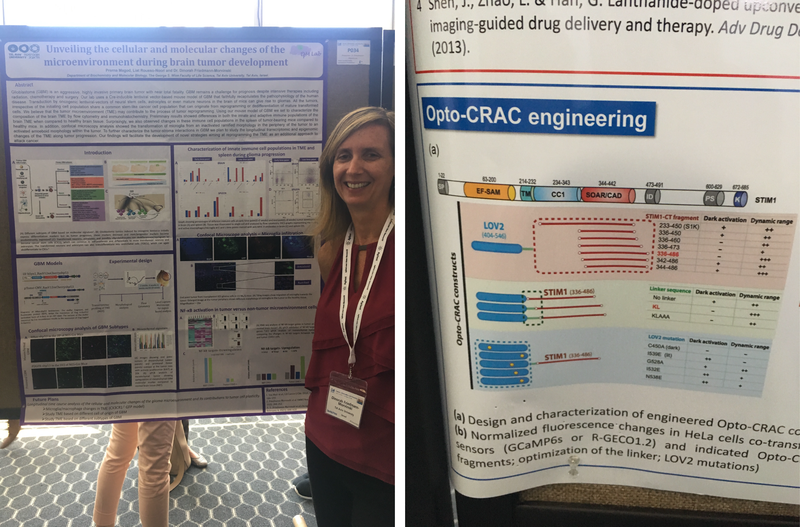 Here the Zhou group presented Opto-CRAC which allows a researcher to control immune signaling and inflammatory responses remotely with spatiotemporal precision. This is a great tool to regulate and observe the function of immune cells that are not excitable but responsive to calcium. We’d love to expand our cancer and immunology resources. If you have a great new plasmid you’d like to share with the scientific community, contact deposit@addgene.org to find out more about our free deposit and distribution service! 1. Pietrocola, Federico, et al. "Caloric restriction mimetics enhance anticancer immunosurveillance." Cancer cell 30.1 (2016): 147-160. PubMed PMID: 27411589. 2. Todoric, Jelena, Laura Antonucci, and Michael Karin. "Targeting inflammation in cancer prevention and therapy." Cancer Prevention Research 9.12 (2016): 895-905. PubMed PMID: 27913448. 3. Cai, En, et al. "Visualizing dynamic microvillar search and stabilization during ligand detection by T cells." Science 356.6338 (2017): eaal3118. PubMed PMID: 28495700. 4. Zelenay, Santiago, et al. "Cyclooxygenase-dependent tumor growth through evasion of immunity." Cell 162.6 (2015): 1257-1270. PubMed PMID: 26343581. PubMed Central PMCID: PMC4597191. 5. Eyquem, Justin, et al. "Targeting a CAR to the TRAC locus with CRISPR/Cas9 enhances tumour rejection." Nature 543.7643 (2017): 113-117. PubMed PMID: 28225754. 6. Marumoto, Tomotoshi, et al. "Development of a novel mouse glioma model using lentiviral vectors." Nature medicine 15.1 (2009): 110-116. PubMed PMID: 19122659. PubMed Central PMCID: PMC2671237.